This originally appeared in Natural Life Magazine, November/December, 1994. Going to the moon didn’t really matter, it turned out. I say that from the vantage point of my six decades living on Planet Earth, but also because of something I saw not so long ago. It was at Booker T. Washington High School where I watched an official astronaut  a handsome, well-built man in his prime, dressed in a silver space suit with an air of authentic command  try to get the attention of an auditorium full of Harlem teenagers. It was the Board of Education’s perfect template for dramatic success  a distinguished black man leading ignorant black kids to wisdom. He came with every tricky device and visual aid NASA could muster, yet the young audience ignored him completely. I heard some teachers say, What do you expect from ghetto kids?, but I don’t think that explained his failure at all. The kids instinctively perceived this astronaut had less control over his rocket vehicle than a bus driver has over his bus. I think they had also wordlessly deduced that any experiments he performed were someone else’s idea. The space agency’s hype was lost on them. This man for all his excellence was only some other man’s agent. The kids sensed that his talk, too, had been written by someone else  that he was part of what the Protestant theologian Reinhold Niebuhr called the non-thought of received ideas. It was irrelevant whether this astronaut understood the significance of his experiments or not. He was only an agent, not a principal  in the same way many school teachers are only agents retailing someone else’s orders. This astronaut wasn’t walking his own talk but someone else’s. A machine can do that. It seems likely that my Harlem kids considered going to the moon a dumb game; obviously I didn’t verify their feelings scientifically but I knew a lot of them didn’t have fathers or much dignity in their lives, and about half had never eaten off a tablecloth. What was going to the moon supposed to mean to them? If you asked me that question I couldn’t answer it with confidence, and I had a father once upon a time…and a tablecloth, too. If the truth were told, in my 30 years teaching in New York City, sometimes teaching prosperous white kids instead of Harlem kids, sometimes a mixed bag of middle class kids, I never hear a single student  white or black  speak spontaneously of the U.S. space program. When the Challenger space shuttle blew up there was a momentary flicker of curiosity, but even that passed in an instant. Going to the moon didn’t matter, it turned out, though the government threw 100 billion dollars into the effort. A lot of things don’t matter that are supposed to; one of them is well-funded government schools. 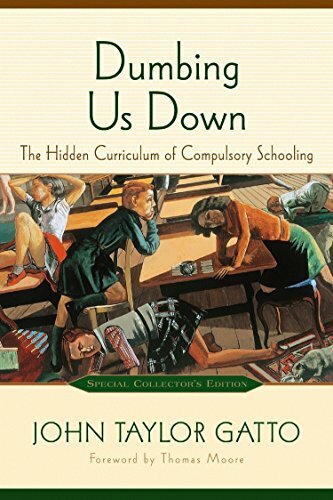 Saying that may be considered irresponsible by people who don’t know the difference between schooling and education, but over 100 academic studies have tried to show any compelling connection between money and learning and not one has succeeded. Right from the beginning schoolmen told us that money would buy results and we all believed it. So, between 1960 and 1992 the U.S. tripled the number of constant dollars given to schools. Yet after 12,000 hours of government schooling one out of five Americans can’t read the directions on a medicine bottle. After 12,000 hours of compulsory training at the hands of nearly 100 government-certified men and women, many high school graduates have no skills to trade for an income or even any skills with which to talk to each other. They can’t change a flat, read a book, repair a faucet, install a light, follow directions for the use of a word processor, build a wall, make change reliably, be alone with themselves or keep their marriages together. The situation is considerably worse than journalists have discerned. I know, because I lived in it for 30 years as a teacher. He was right. I was the one who did it just as much as any other teacher who takes up the time young people need to find out what really matters. I did it innocently and desperately, trying to make a living and keep my dignity, but nevertheless I did it by being an agent of a system whose purpose has little to do with what kids need to grow up right. My critic had two college degrees it turned out, and his two degrees were shrieking at me that going to school doesn’t matter very much even if it gets you a good job. People who do very well in schools as we’ve conceived them have much more than their share of suicides, bad marriages, family problems, unstable friendships, feelings of meaninglessness, addictions, failures, heart by-passes that don’t work and general bad health. These things are very well documented but most of us can intuit them without any need for verification. If school is something that hurts you, what on earth are we allowing it for? Does going to school matter if it uses up all the time you need to learn to build a house? If a 15-year-old kid was allowed to go to the Shelter Institute in Bath, Maine, he would be taught to build a beautiful post-and-beam Cape Cod home in three weeks, with all the math and calculations that entails; and if he stayed another three weeks he’d learn how to install a sewer system, water, heat and electric. If any American dream is universal, owning a home is it  but few government schools bother teaching you how to build one. Why is that? Everyone thinks a home matters. The things that matter in a bad life, we know, are: gaining power over others, accumulating as much stuff as you can, getting revenge on your enemies (who are everywhere), and drugging yourself one way or another to forget the pain of not quite being human. 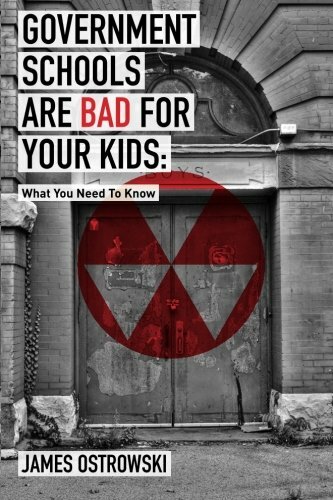 School teaches most kids how to strive for a bad life and succeeds at this so well that most of our government machinery eventually falls into the hands of people who themselves are living bad lives. We’re all in deep trouble because of that. It’s the best reason I know to keep the machinery of government just as weak and as primitive as possible as soon as we figure out how. It surprises me how many graduates leave college assuming they know what matters because they got straight As. If we can believe advertisements, what matters to these people most is the personal ownership of machinery: blending machines, cooking machines, driving machines, picture machines, sound machines, tooth-brushing machines, computing machines, machines to kill insects, deliver intimacy, send messages through wires or the naked air, entertainment machines, shooting machines, and many more mechanical extensions of our physical self. Indirect control over even more ambitious machine seems to matter a lot, too: flying machines, bombing machines, heart and lung machines, voting machines, and a great variety of other mechanical creations. All these devices are meant to defeat what otherwise would occur naturally if they didn’t exist. They are all machines to beat human destiny and confer on human beings magical powers and the reach and longevity of gods. Do they deliver what they promise? Is human life in a net sense better since their advent? I can’t answer that for you, of course, but you can look into your heart and answer the question for yourself. Someone has apparently convinced us that what occurs naturally cannot be the way to a good life, hence these battalions of machinery. What percentage of your life is spent talking to machines? Buying them, mastering them, ministering to their needs, then betraying them with ever newer and newer machine loves? 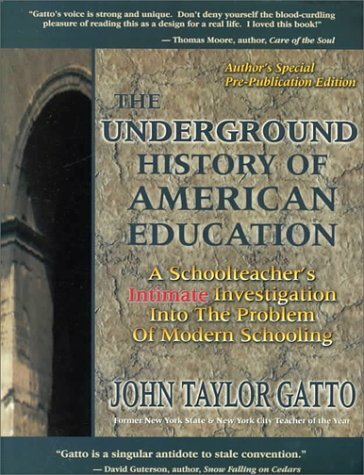 John Taylor Gatto is the author of Weapons of Mass Instruction: A Schoolteacher’s Journey through the Dark World of Compulsory Schooling, The Underground History of American Education: A School Teacher’s Intimate Investigation Into the Problem of Modern Schooling, and Dumbing Us Down: The Hidden Curriculum of Compulsory Schooling. He was 1991 New York State Teacher of the Year.